You have taken a license of some intellectual property rights with a view to exploiting them. We can assume the licensor was probably the author or creator and that he/she did not want to set up in business to exploit the rights personally. The rights could relate to anything: architect’s drawings, children’s stories, photo images. The work could be of any size, complexity and for any purpose. For example, it could be a plain script, a book to be converted to script, or any other “created work” or product in which you own copyright. Only you can describe it accurately. For the sake of clarity in the document, we have named your work “Beautiful Zebra”. You now wish to sell some part of your rights to some other business who will exploit your work in whatever limited way you have decided. 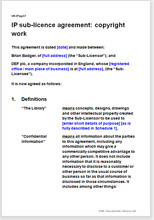 This document could also be used for commercial partnerships, for example to permit an affiliate or partner to use material which you do not actually own but use on licence from the original creator. We do not know what rights in the material you have bought, so cannot guide you on what rights you are able to sub-licence. We have therefore provided the same wide range of options as we do for the creator of a work in the first place. The payment option provided is a periodic royalty. That can be changed easily to a cash payment or some other basis. Almost all Net Lawman documents are written to protect primarily the document buyer. However, we do not invite problems for you by ignoring the likely requirements of your counter-party. There are many provisions in this document which satisfy the concerns of a fair minded licensee. The drafting notes you receive with the document elaborate on this point. You can use this agreement for a one-off deal with few restrictions or for planned expansion into new geographical territories and/or new product markets. control and ownership of derived versions. assignable or not? If yes, buyer enters into same agreement direct with you. you sell upgrades from time to time - or not. whether you have advantage of derived products licensee creates.